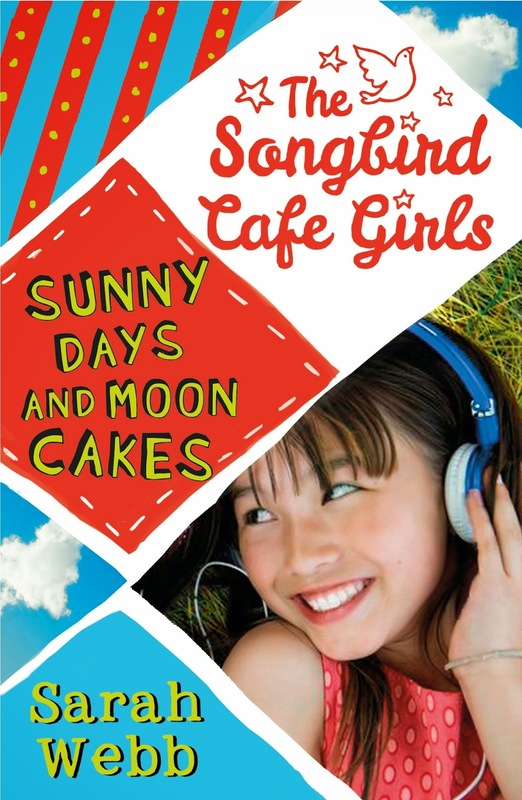 It was great to meet Sarah Webb a few weeks ago and I'm really anticipating her new book, Sunny Days and Moon Cakes, which is the second in the Songbird Cafe Girls series - so I'm delighted to have not just the cover, but also a post from Sarah! I’ve always loved books about islands. I grew up reading Enid Blyton and my favourite books of hers have always been Five on a Treasure Island and The Secret Island. There’s also a wonderful Irish adventure story called Island of the Great Yellow Ox by Walter Macken, and I also love the Anne of Green Gables books, which are set on Prince Edward Island in Canada. A few years ago, I stayed in a yurt (a round Mongolian tent) on a small island called Cape Clear. It was so quiet, so peaceful. There was no traffic noise, only the odd dog barking and birds calling. One night as I lay on the grass, looking at the stars – there were so many glittering above me that I saw not one but two shooting stars – I started to think about what it might be like to live on a small island. Then my writer’s “what if” kicked in and I thought, What if I put outsiders on a small island? Young teenagers. A city girl, a girl who is originally from China, and a girl from New York? And that’s how the Songbird books came into being. The first book in the series, Mollie Cinnamon Is Not a Cupcake, is about a city girl who has to stay on Little Bird (the name I gave my fictional island) with her great granny while her mum films a travel show. This book has just been published. Book two - Sunny Days and Moon Cakes – is out in September. I hope you like the cover. Of all the books I’ve published so far (over 20!) it’s one of my favourites. And I adore the map Jack Noel created of the island. Don’t you just adore maps in books? I do! Sarah Webb is an Irish writer, based in Dublin. Her Ask Amy Green series for reader aged 11+ was shortlisted for both the Irish Book Awards and the Queen of Teen Awards (twice). One day she might actually win! The Songbird Cafe Girls: Mollie Cinnamon Is Not a Cupcake has just been published (Walker Books). Sunny Days and Moon Cakes, the next book in the series, will be out in September 2015. To find out more about Sarah and her writing, find her online at www.sarahwebb.ie. Sunny loves to spend time at the Songbird Cafe, helping Alanna in the kitchen or finding a quiet corner to work on her drawings. Sunny's one wish is that she could speak to her friends – her anxiety means that it's impossible to speak to anyone except her sister, Min, and her parents. Sunny hopes that a trip to China might help to unlock her voice, but she is terrified that her family will discover the secret she's been hiding from them ever since her adoption. Sarah Webb's poignant story celebrates sisterhood and friendship, and reminds us that home can be anywhere, as long as we are with the people we love. Thanks for a brilliant post, Sarah - I can't wait to read the Songbird Cafe Girls books! Sarah is also guest-posting over at my friend Daphne's blog, the fantastic Winged Reviews, today. Check it out!